Biologist discussing Mosquitos this Sunday! Have bug lovers in your family? 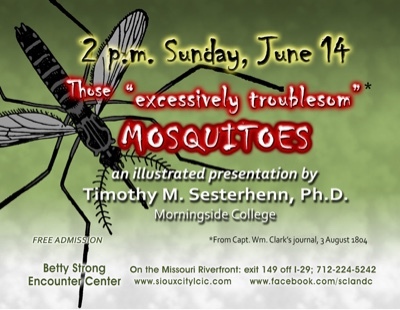 Morningside biology professor Tim Sesterhenn will be giving a presentation for all ages about Mosquitos this Sunday at 2pm at the Betty Strong Encounter Center (which is at the Lewis & Clark Interpretive Center so if your little ones get fussy, you can walk them around the museum instead and it's still a fun trip!). Professor Sesterhenn said while some of the information may be slightly over the heads of early elementary students, in general his talk won't be overly technical, families are welcome, and he will be available afterwards to answer questions from insect lovers of all ages!